I'm scurrying about, packing for a weekend trip to Freeport. Like any good knitter, I'm spending more time picking out my travel knitting than my travel clothes. Almost all my clothes are interchangeable, so as long as they're clean, I'm good to go. The knitting on the other hand . . . Apparently I'm still on a gradient kick. This time I chose a color set to match the weather. If you look closely, you can even spot a few fresh snowflakes. The gray theme has spilled over into my color inspiration for the week. 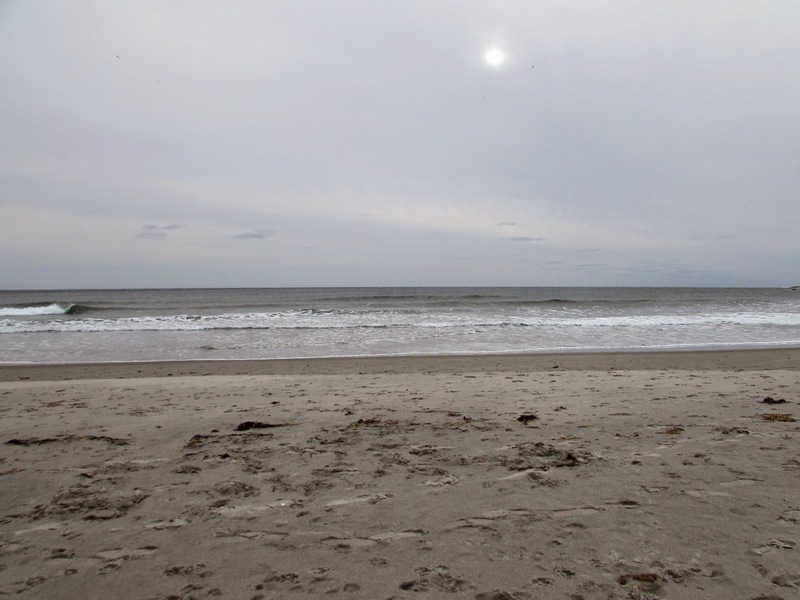 There's nothing quite like the beach on a winter day, complete with a weak sun. One of the inconveniences of all the snow has been irregular mail delivery. USPS service has been spotty all month, and we went more than two weeks without receiving any mail. Then one day last week we received a huge delivery. Since that mail drop, we haven't received anything else. I'm trying to roll with it. At least UPS, FedEx and the pizza guy have been able to find their way to my front door. This delivery arrived yesterday, and I'm thrilled. Bags from Third Floor Studio. This coming weekend I'm in Freeport for Spa Weekend. I'll have these bags and more in the booth. If you're in the Boston area, on Saturday Christine from Third Floor Studio will be on hand at Fiber Arts Day in Jamaica Plain. JP Knit & Stitch will also be there along with other fiber vendors. This event is part of the Egleston Square Farmers' Market. Food and fiber . . . a great combination. It was bound to happen. 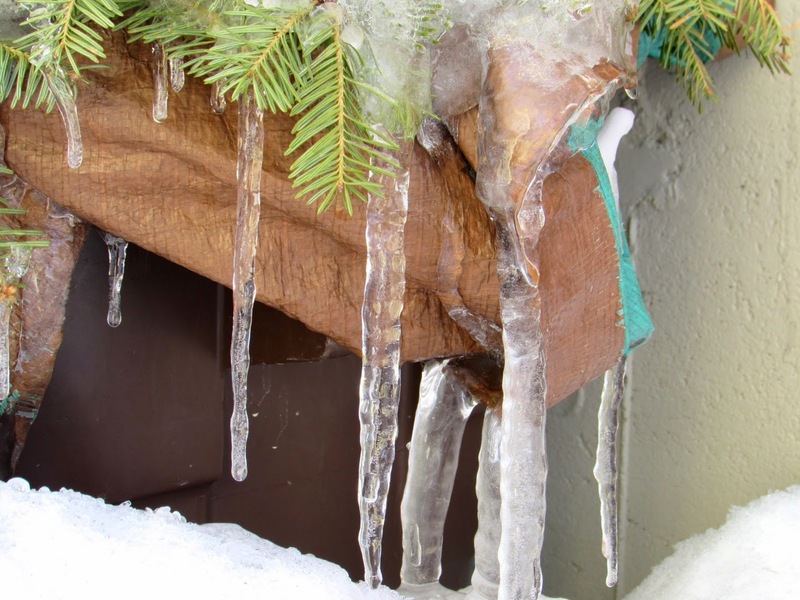 Over the weekend the current cold-from-hell circulating in my household finally caught up with me. This particular strain includes a killer cough complete with violent coughing fits intent on bursting a vessel. In fact last week I took my son to the doctor because his cough was disturbingly bad. The doctor assured us it wasn't pneumonia but warned us to come back if it got worse. I was taking all kinds of precautions to keep this awful bug at bay - tea, mega doses of Vitamin C, more tea and keeping a safe distance from anyone with the slightest sniffle. I even considered locking myself in a room, but in the end that just wasn't a practical option. Despite my valiant efforts, on Friday I could feel the cold creeping in and by Sunday I was down. This limited my schedule in many ways, but it didn't keep me from picking up my knitting. Even though I felt miserable, forward progress on Fiar kept me in good spirits. Today I've definitely turned the corner. I'm back at it and making up for lost time. We're heading into the last week of February, and it's time for the monthly giveaway. Leave a comment and include your Ravelry ID. 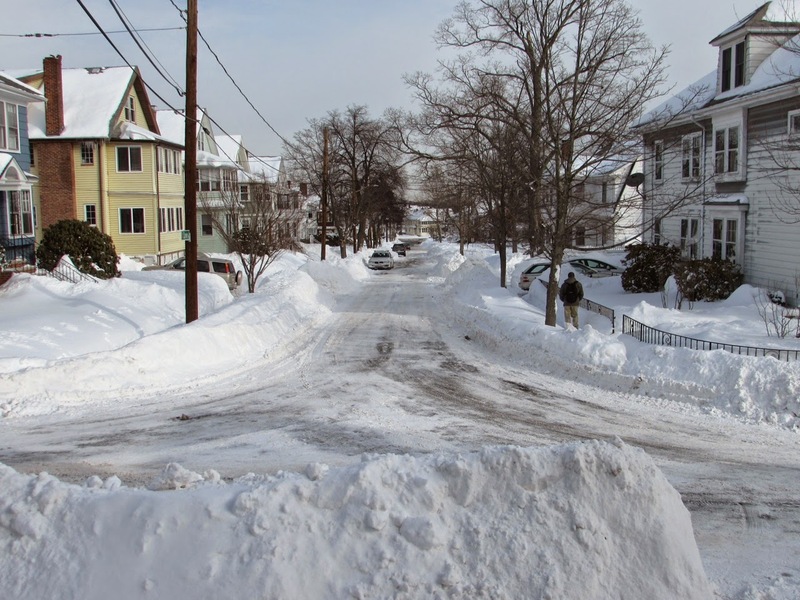 If this winter has been particularly challenging in your neck of the woods, how have you been coping? 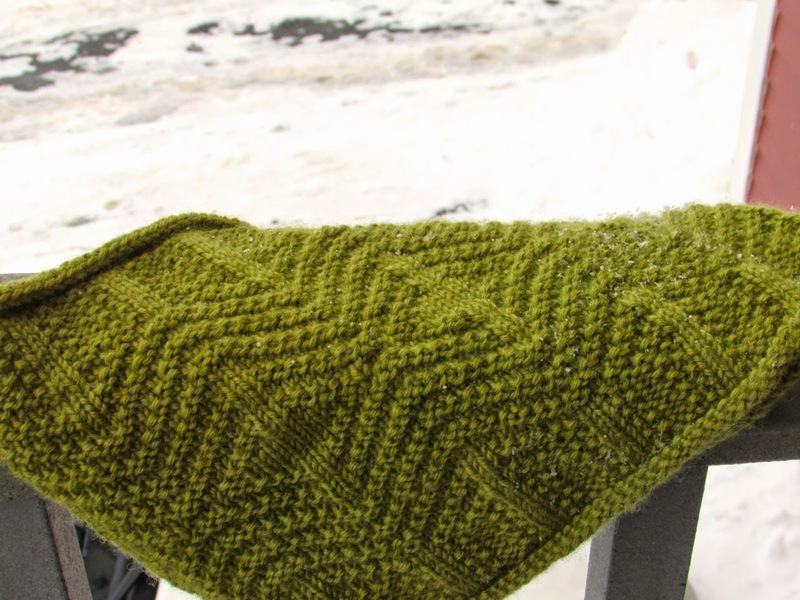 Have snow days given you extra knitting time? 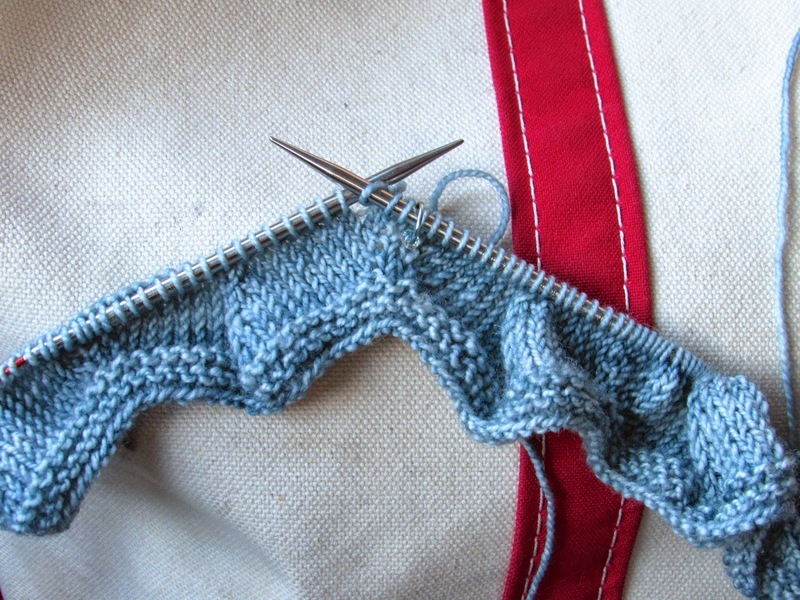 What's on your needles? 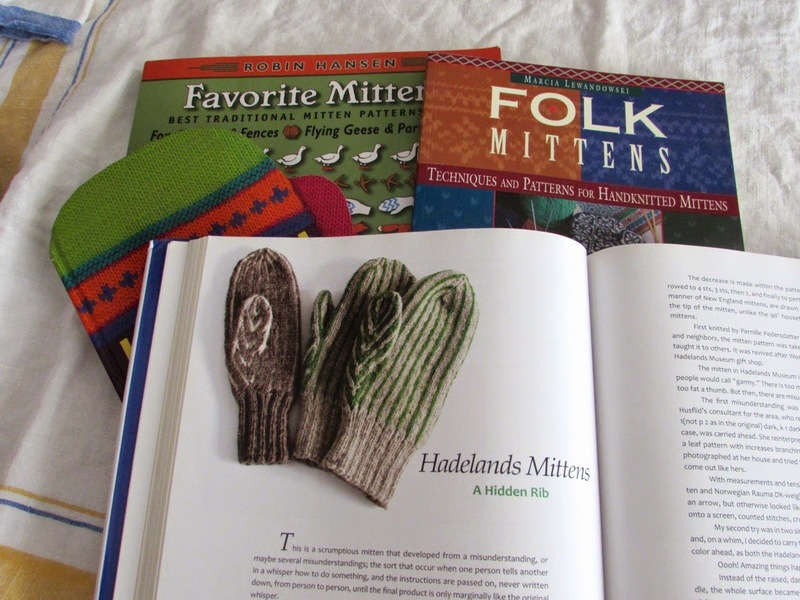 Is anyone looking ahead to spring knitting? 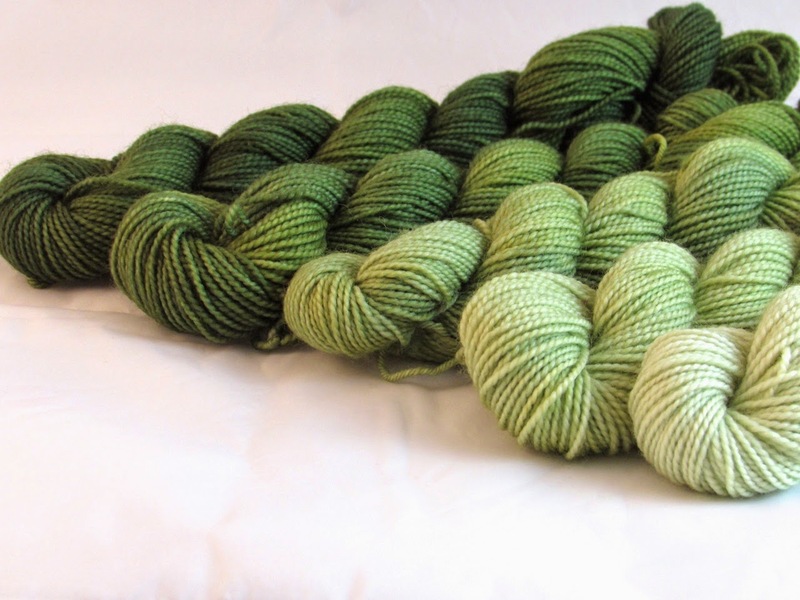 The winner, chosen at random, will receive a skein of Dirty Water DyeWorks yarn - winner's choice. The contest closes on Monday, March 2, 2015. It's been a topsy turvy day. Due to some unavoidable scheduling, this morning was like my typical afternoon. Now that it's afternoon, I'm trying to recover my morning. I'm looking forward to a clean slate tomorrow. These days I'm in full production mode with lists on top of lists. These sets have kept me entertained. 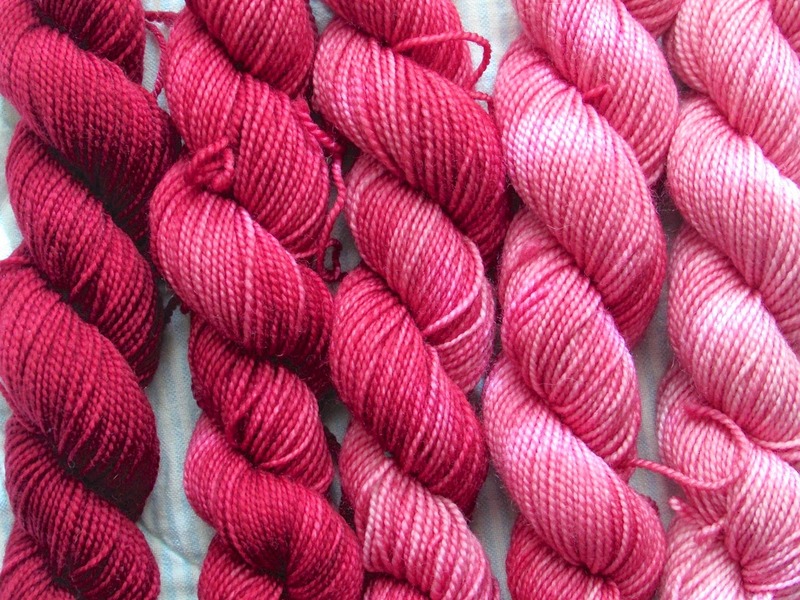 I could churn these out until spring, but I consulted my master list and called a halt to gradient production. I have a show next weekend, and there are plenty of other things that need my attention. I was browsing through pictures when this week's color inspiration caught my eye - a sunflower late in the season at the farmers' market. 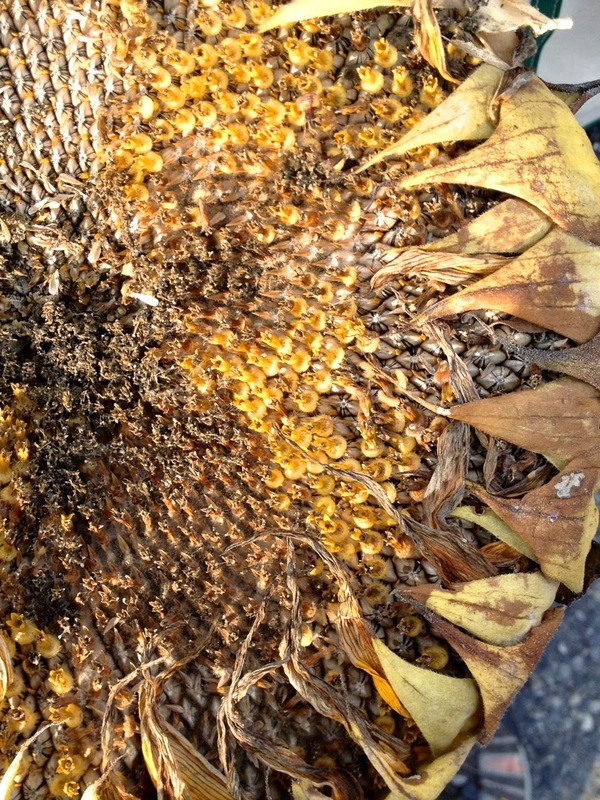 Dried with a hint of yellow. This is turning out to be one of those weeks where I'm pulled in different directions. I'm focusing on short-term production while considering long-term goals. 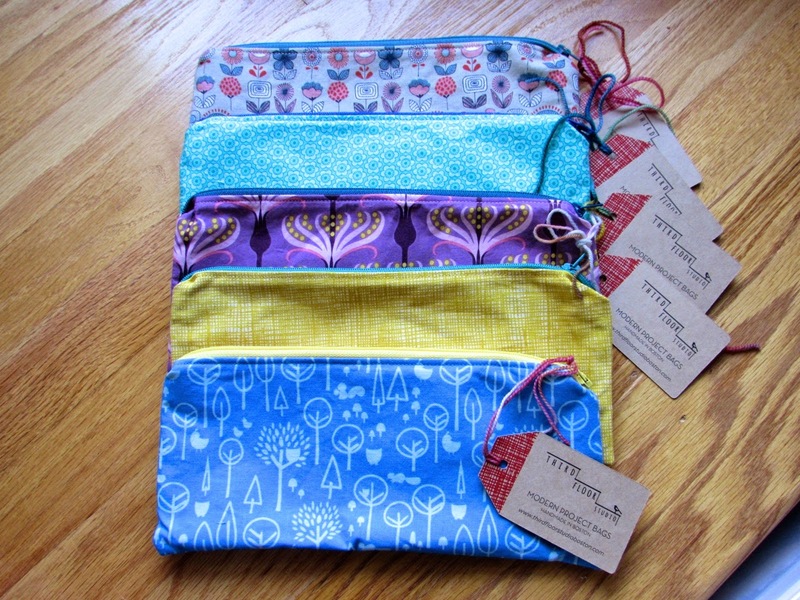 I'm juggling between show prep, retail orders and wholesale orders. The mere mention of paperwork and taxes will likely push me over the edge. 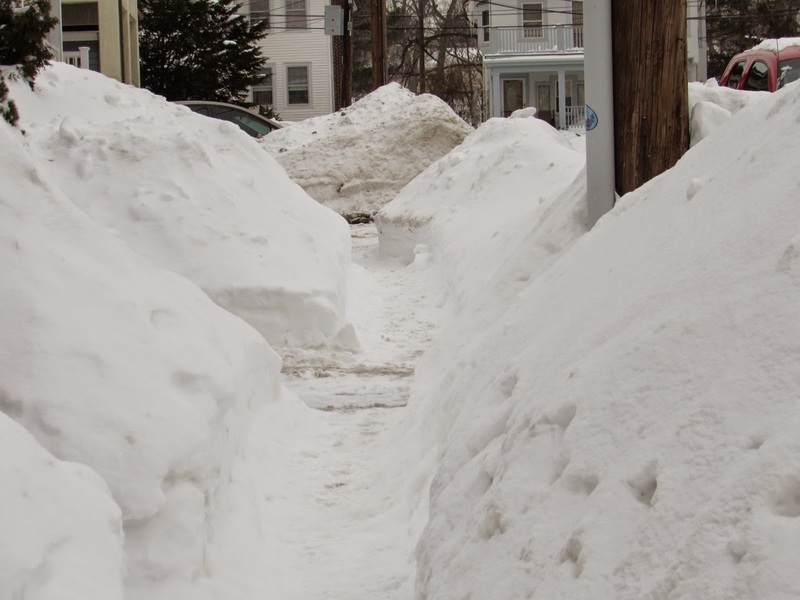 To clear my head I've been shoveling the snowbank at the end of the driveway. Every day I go out and chip away at it. Slowly, slowly it's shrinking. 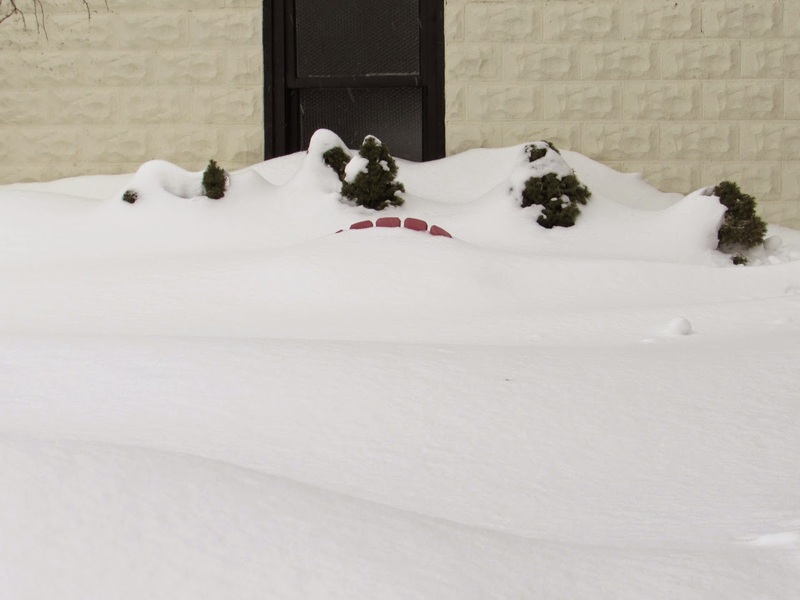 The truth of the matter is, it's really the neighbor's snowbank, but it's blocking easy access to my driveway. At first I thought the neighbor would finish the job and clean up the messy pile, but that hasn't happened and I got tired of all the back and forth turning to get into my driveway. The other day I took matters into my own hands and picked up a shovel. It's been a good challenge and, with any luck, I'll have it cleaned up before the next snowstorm hits. While I shovel, I organize my thoughts around deadlines. I'm on deadline with various projects. As much as I dread the pressure of a hard and fast time frame, it can be a great motivator. Last week I met one of those deadlines. Yarn Knot Socks shipped. Everyone should have received their packet by now, so I don't think I'm spoiling any surprises. Of course now I want to start these socks. Maybe after my next round of shoveling . . . It was a productive weekend, especially if you count shoveling snow, but I didn't let the winter storm distract me from my work. In between dyeing and shoveling, I found time for knitting. This is one of those projects that's hard to put down. I'm using a gradient set and was on a tear to finish the first color. Now I'm on the second color and am racing to the third. Please ignore the color discrepancies. Winter lighting is challenging. It's Monday and my to-do list is a mile long, but I'm determined to find time for this project . . . after I assess the shoveling situation. I've been chugging right along with new booth samples - one finished, another one under construction. 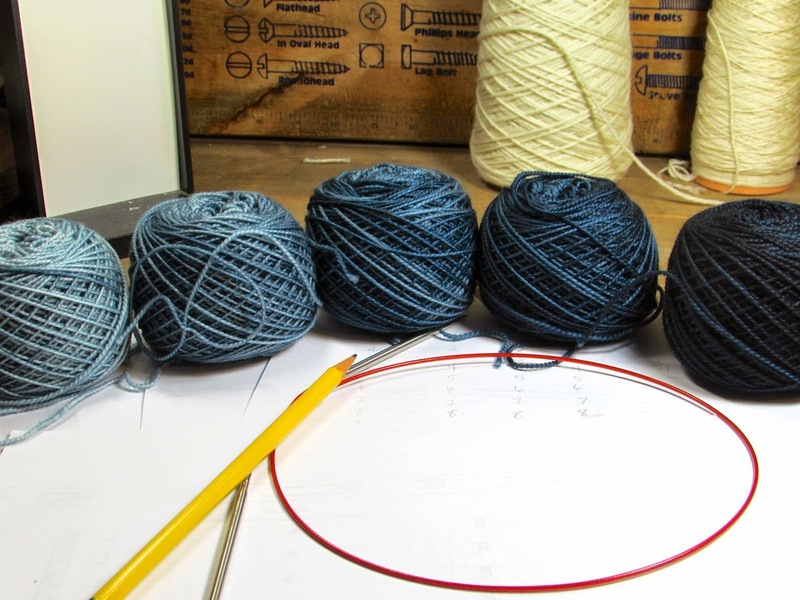 I may be struggling to stay on track with my dyeing schedule, but the knitting side of the operation is on target. For the moment. And really, when it looks like this outside, all I want to do is stay put and knit. This uneven path is my sidewalk. It's a road to nowhere because I can't even make it to the corner without scaling that huge snowbank at the end. Our weekend weather forecast includes another foot of snow (that's 30 cm for those of you who are metric-minded), so there's more prime knitting time headed my way. Off the needles . 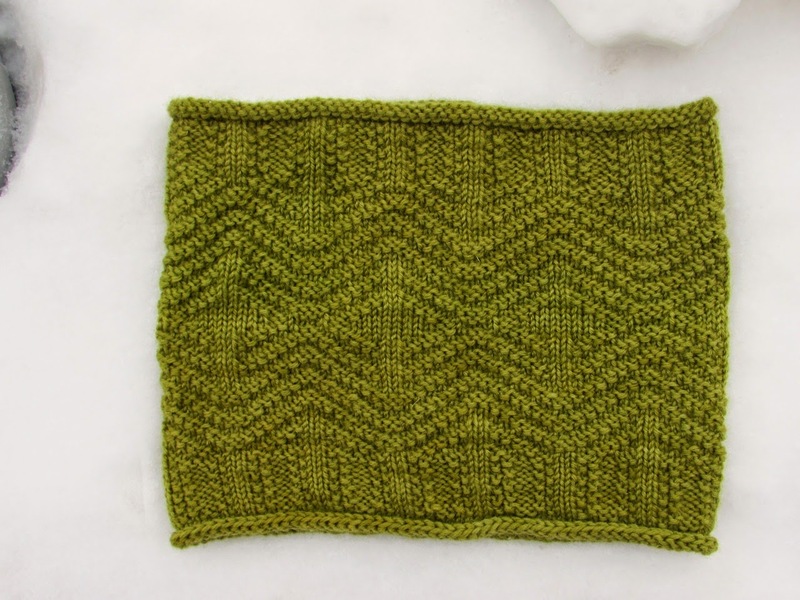 . .
Dovetail Cowl. I love this pattern. Simple knit and purl combinations can entertain me for hours. This pattern includes two sizes, and I made the smaller one this time around. A couple years ago I made the larger size, but that one has gone missing. I think I might have loaned it to a yarn shop, and I'm sure it will surface eventually. In the meantime I used its absence as a good excuse to make another one. 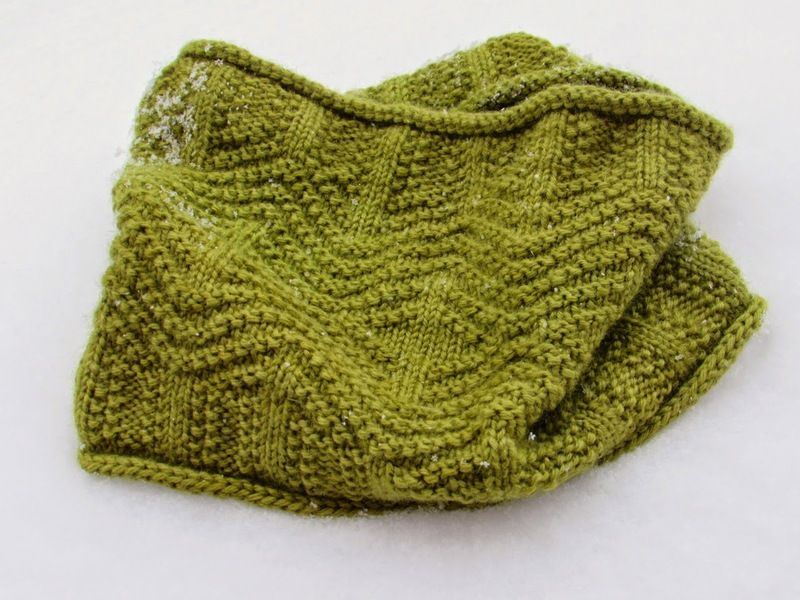 The yarn is Petite Clara, colorway Chartreuse. This BFL yarn is always a favorite, and lately I've been smitten with this colorway. See my Algonquin Hat. In an attempt to achieve balance, I'm making a concerted effort to steer clear of green for my upcoming projects. For this week's color inspiration I revisited my inspiration from two weeks ago. That splash of red is barely visible now, and by Monday I'm sure it will be gone. Last night I sat down to cast on with one of my new gradients. My regularly scheduled knit night was in disarray due to towering snowbanks, lack of parking and general snow fatigue, so I felt entitled to start something new. 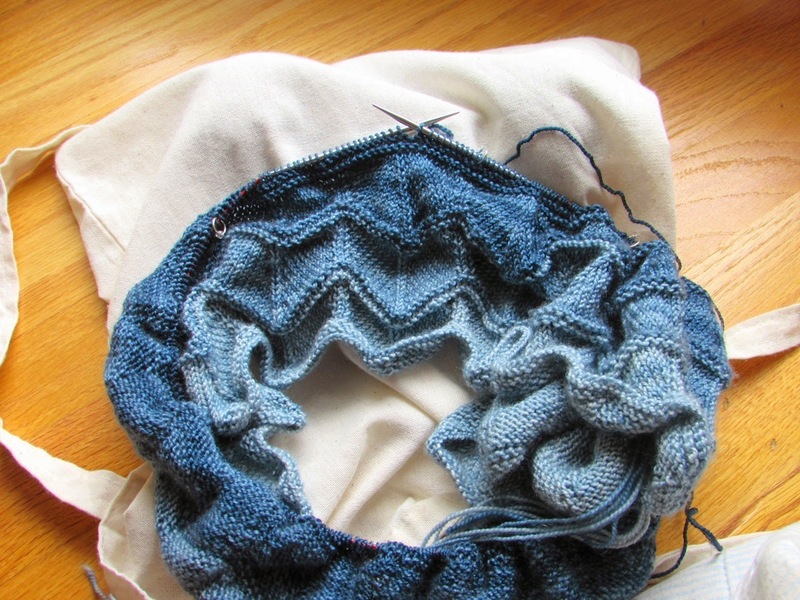 I'm working with a pattern that requires a little tweaking - the math kind of tweaking. 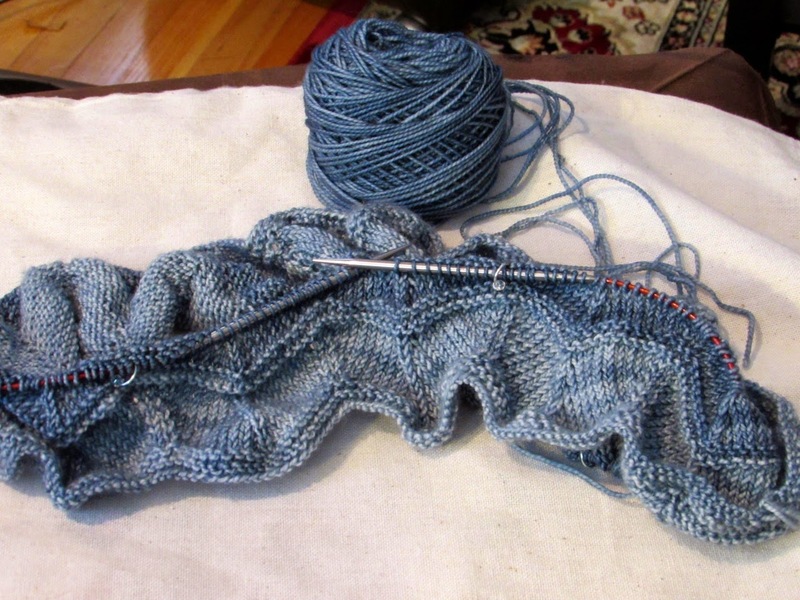 The reckless knitter in me said, "Go ahead, cast on. You can figure out the numbers on the fly." The practical knitter in me said, "You're on a really tight deadline and can't afford to waste precious knitting time. Figure out the numbers ahead of time so you don't have to rip and re-knit." 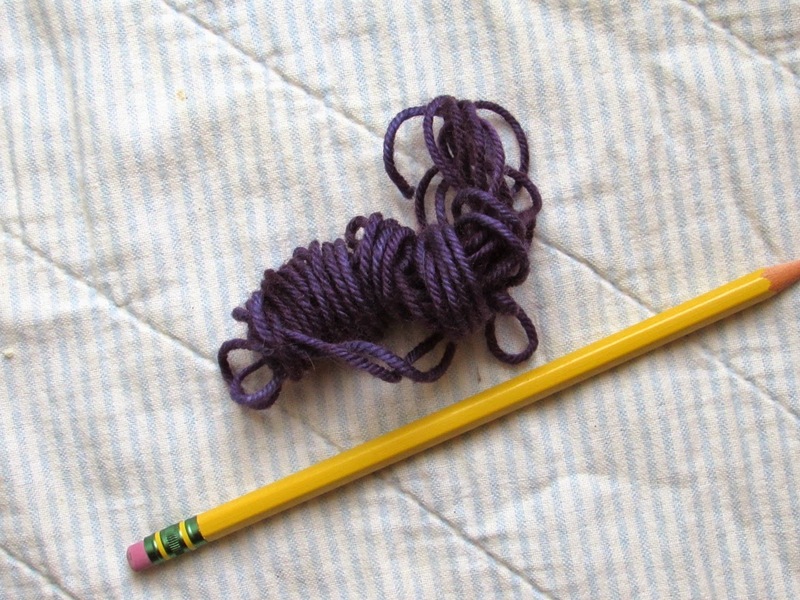 I followed the advice of the practical knitter but didn't get very far. Part of the fun - and frustration - of numbers is that you can work them in so many different ways. Last night I didn't find a way that worked for me, so I'm back at it this morning. This time I have a clear head and coffee in hand. Maybe that will help. I've been having loads of fun with the dye pots. Pick a color . . . any color. Play around with the shades and you end up with something like this. Of course I can't stop with just one. I have a long list of colors to experiment with. More to come . . .
For the past couple weeks I've been debating new booth samples. 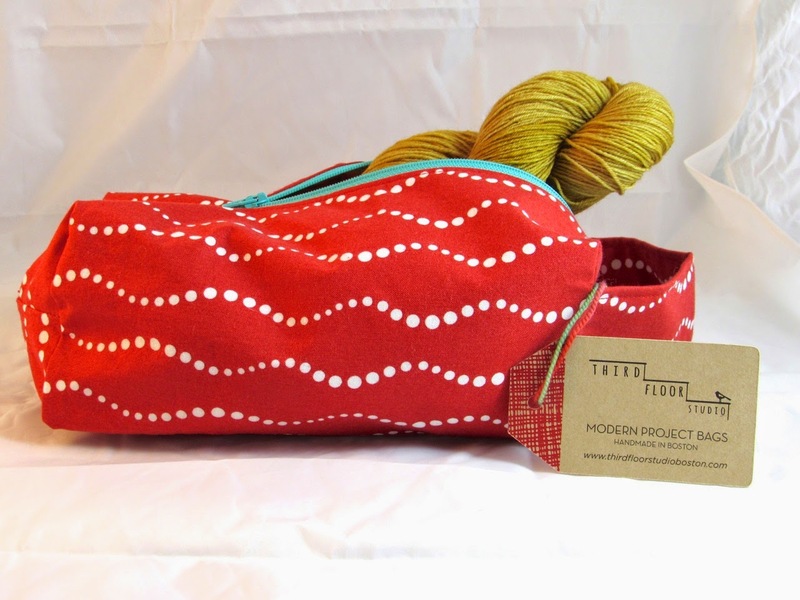 I've been very indecisive - not because I couldn't find projects I like but because there are so many to choose from. I bounced around Ravelry like a toddler on a sugar high. I like this one . . . but then there's this one . . . or maybe this one. I couldn't make my final selections. The decision-making solution was simple - paper and pencil. 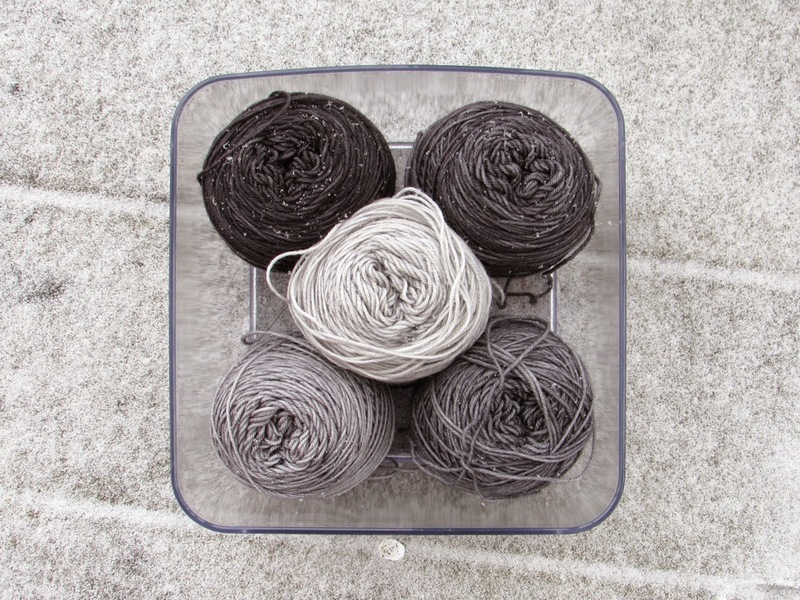 I listed the top contenders on a piece of paper along with yarn options, yardage, colors etc. In no time at all I made my decisions. Now I can get busy. 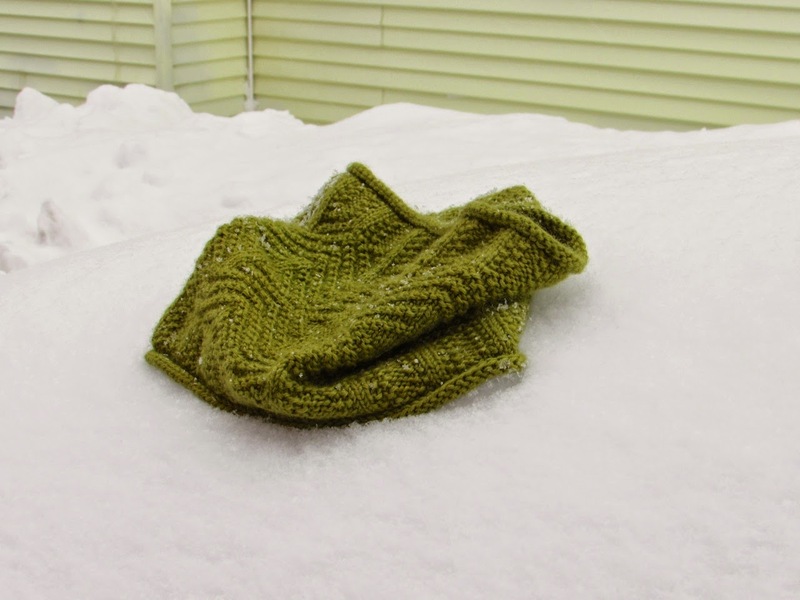 I spotted this week's color inspiration during one of my many shoveling sessions. Ice can be beautiful and treacherous all at the same time. Oh, the snow . . .
Over three feet of white has brought everything from cancelled classes to impossible parking to commuter woes. Shoveling has become my top priority, and I plan my day around it. Even when I think I've finished, I always find more to do. I'm motivated by my 80+-year-old neighbor who has raised the bar when it comes to snow removal. He's out there every day moving snow around. The snow has interrupted my work flow, and it made a joke of yesterday's to-do list. I rolled it over into today's list to create a mountain of work as big as these snow piles. I need to make a grocery store run and was going to wait another day until I realized we are almost out of coffee. I've just bumped this chore to the top of the list. In spite of the hassle, the snow is wonderful. This is my favorite weather. Yesterday when my daughter was grumbling about the snow, I reminded her that there's nothing like the quiet and calm after a snowstorm. New fallen snow makes the world slow down, and sometimes we need that. It's magic. All this snow has taken its toll in other ways. 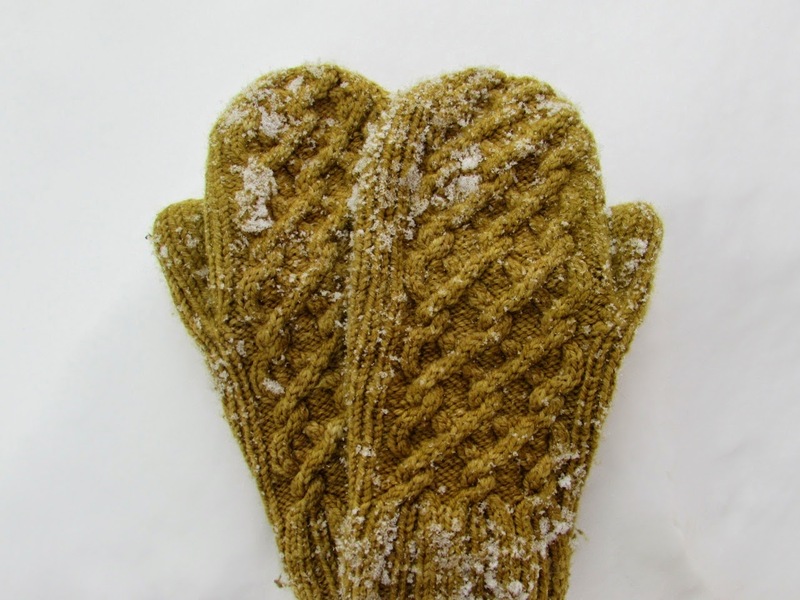 This is my favorite pair of mittens - Rhinebeck 2012 Mitten. The other day when I came in from a shoveling session, I realized the ribbed palms are wearing thin. This has been my go-to pair for a couple years now, so I really shouldn't be too surprised. I decided that before the palms wear through, I should start construction on another pair. 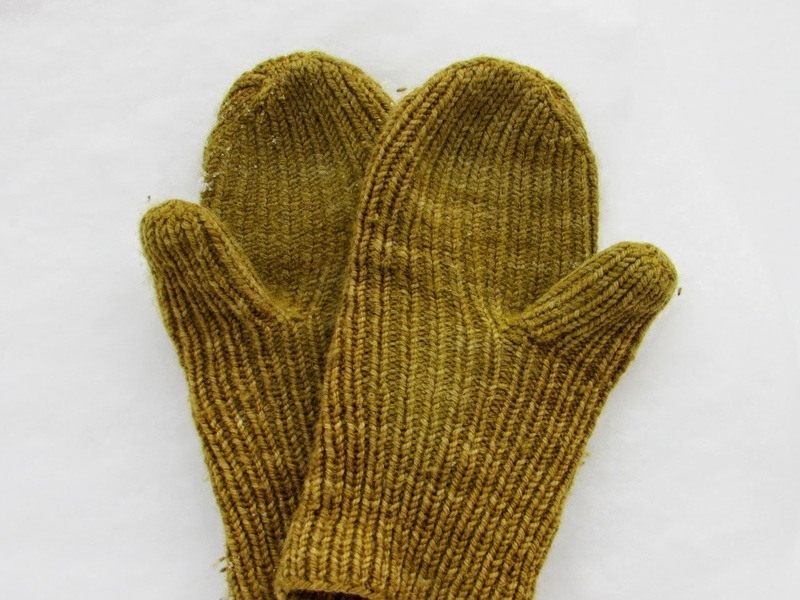 I thought of making the same mittens since I like them so much, but it would be fun to try something new. Thanks to everyone who left a comment for the January giveaway. 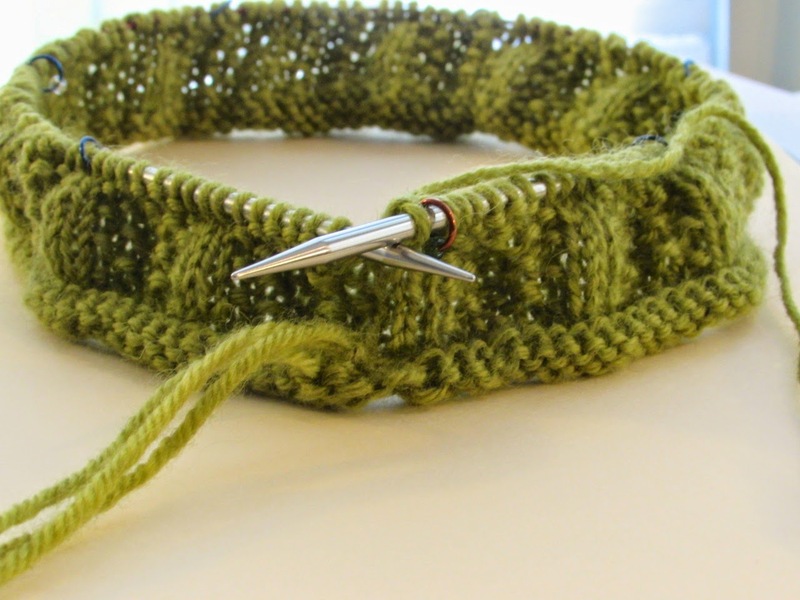 It seems that hats are the most popular item to knit right now. I loved the comment from Laura whose son competes in chess tournaments. "He has declared a hat I knit for him as his 'lucky hat' and insists on wearing it for every tournament." The winner this time around is ckmary. Keep your eyes open. I'll be doing the same thing later this month. Today my timing is spot on. We have another foot of snow in the weather forecast, and I have a new hat to go with it. Rikke Hat. My models have all trudged off into the blinding snow, so this quick outdoor shot will have to do. See the Ravelry pattern page for more pictures. This hat is all mine, but if one of my daughters had been around to model, we might have had a custody battle. 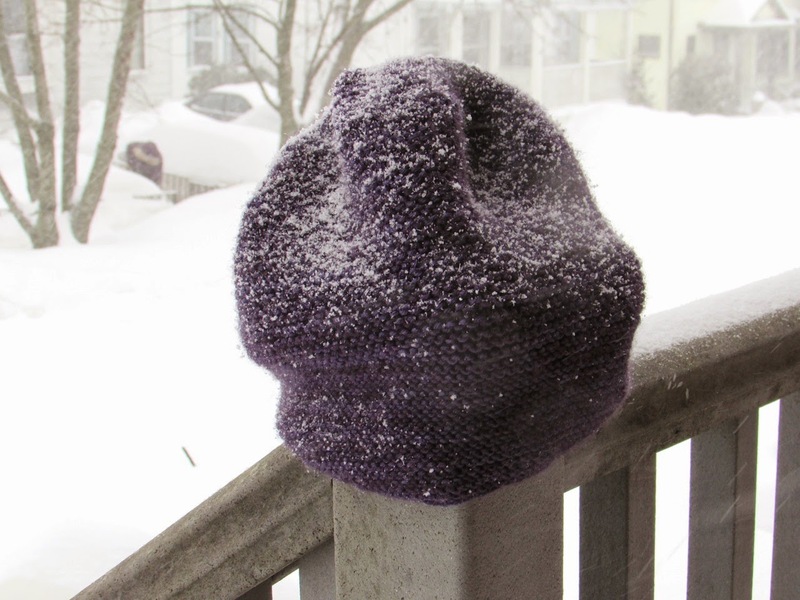 This garter stitch hat is so elastic - I'm sure it will fit a variety of head sizes and shapes. It's soft, squishy and comfortable. 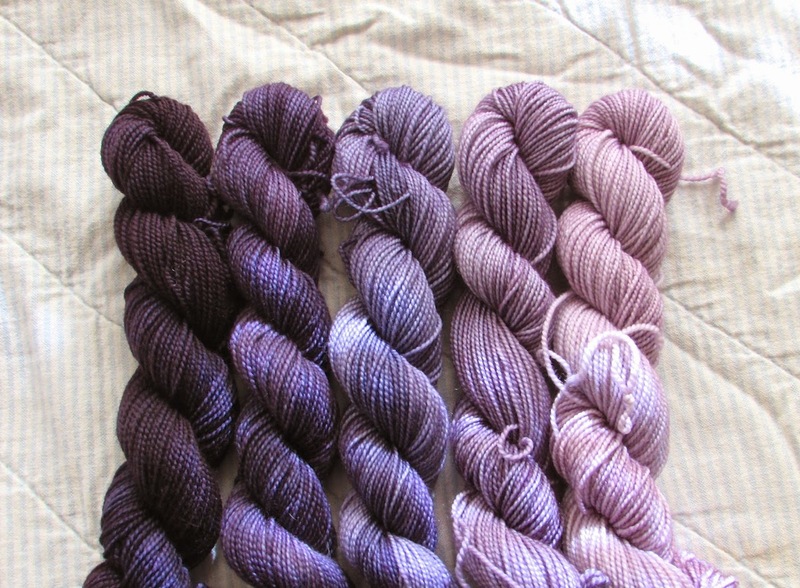 The yarn is Marie, colorway Eggplant. I used almost the entire skein. Yes, I was getting a little nervous near the end. Worst case scenario I would have had to rip back a few rounds before the decrease rounds. Today is the last day to enter the January giveaway. Follow the link for details. I hear my neighbors hard at work. 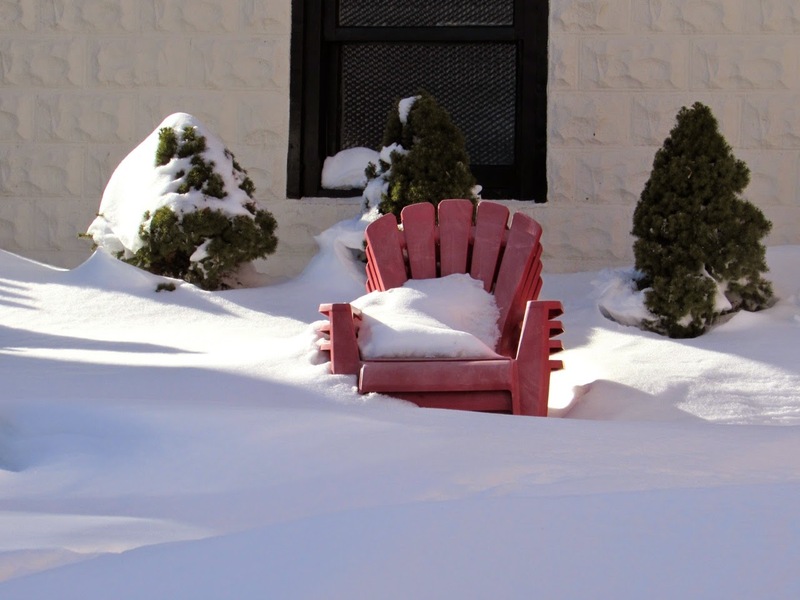 It's time to head outside and get started on the shoveling.